Do Your Lockers Make The Grade? Under the Personal Protective Equipment at Work Regulations 1992, employers are required to provide suitable clean, dry and secure storage to protect PPE from damage, contamination or loss. Plus, today it is becoming increasingly important for employers to consider staff wellbeing, and providing somewhere safe to store personal belongings may be considered part of this obligation. Many of our lockers in standard configurations have been tested and conform to the requirements of the British Standard for Clothes Lockers BS 4680: 1996 ‘Standard Duty’. This includes tests for strength, rigidity, material, paint adhesion and quality. Look out for the icon alongside the products. All of our lockers are protected by a hard wearing anti-microbial coating, to help reduce the risks associated with bacterial cross-contamination from surfaces with high frequency contact such as lockers. The coatings have been proven to reduce levels of MRSA bacteria by over 95%. ...We Can Manage Your Locker Project? If you require new locker systems for your changing rooms, canteens or staff areas, why not ask us for a quote. We can suggest the best possible layout and design to make the most of your space, and also assist in your choice of locker styles. We can provide CAD designs and take into account any extra requirements you may have such as additional hanging space or space for dirty clothes. From idea to installation your Key Account Manager is on hand to help, call 0800 294 4440 for more information. When it comes to buying lockers there is a huge range of products to choose from and making sure you invest in products that are suited to your environment is vital. Size, colour, material, locking systems, the overall level of security required and even anti-bacterial coatings are all key considerations when investing in lockers. The first thing to consider is the number of doors, tiers or compartments that you need. Often this is influenced by the contents that will be stored in the lockers – if people will need to hang workwear or other items of clothing in them then they need to be an appropriate size. Alternatively, if they’re just to keep packed lunches safe then small compartments will suffice! Generally locker units offer between one and six compartments in vertical configurations. In addition, you can choose from various group configurations and it’s possible to create bespoke solutions if there are space constraints or specific storage requirements. Often in areas where space is limited ‘twin lockers’ are a good option because they can accommodate two people’s belongings but are only the width of a single unit. 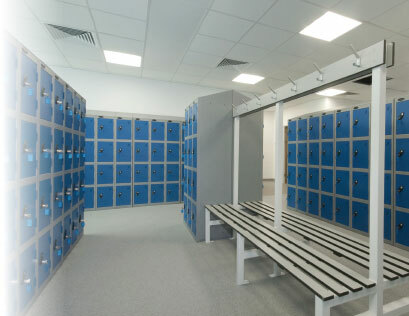 Internally, lockers can offer a full range of configurations with shelves, hanging rails and central partitions to provide separate storage areas for clothing if wet or dirty. The material that the locker is made out of will often be influenced by its surrounding environment. In wet areas, ventilated plastic or lockers coated with a corrosion protection are ideal. In outdoor environments, lockers with reinforced doors and secure deadlocks can help to avoid vandalism. Some lockers also feature clear panels in the doors or are made of wire mesh which can actually deter thieves because the contents can easily be monitored without having to open their doors. Anti-bacterial protection is another popular feature that now comes as standard on lots of lockers.These products use an additive in the paint finish that inhibits the growth and migration of bacteria on its surface and can reduce cross-contamination from surfaces with high frequency contact. Last, but by no means least, is the locking system and again there are options for every environment that each come with their own list of pros and cons.There are key operated locks or systems that are secured with a padlock. Alternatively for lockers that the public will use, coin operated systems are the obvious choice and some of these retain the coins to provide an additional income stream. Take a look at the following product highlights, which illustrate the main differences between the types of lockers on offer. With the help of the “Your Guide” over the page you can establish which product would be most appropriate for your needs. Standard / Coloured Lockers - These are best for those who require a simple locker storage system at a great price. They are available in a range of door options and colours. Sloping top lockers are available to prevent items being placed on the top of the lockers. Two Person Lockers - Also known as twin lockers. These are a cost effective solution and ideal for those who do not have much space. They often come with hanging space and shelves to make optimum use of the space available. 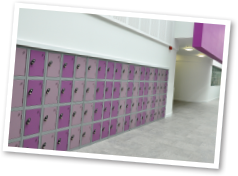 Uniform Lockers - These are multi-compartment lockers which are ideal for those who need to wear a uniform. You can also get large capacity uniform lockers which provide extra space to store bulkier items. Clean and Dirty Lockers - A partitioned locker which is useful to separate clean and dirty or wet and dry items. They contain ventilation slots to allow wet clothing to breathe. Mesh Lockers - These are made from wire and are used mainly for security purposes. The contents are easily visible and can be used in areas where theft may be an issue. The wire mesh also can be used to ventilate wet clothing. Personal Effects Lockers - These are space saving small lockers which can be used for the storage of bags and valuables. There are locker types specifically made for the storage of laptops which have additional security in the form of an ASSA deadlock, and an optional security strap can also be fitted. Wet Area Lockers - These tend to be either plastic or pre-coated steel to prevent the lockers from rusting in a damp environment. They have ventilation holes to allow wet items to breathe. Due to the fact that they are often used in gyms and leisure centres, they can be fitted with a coin operated lock.